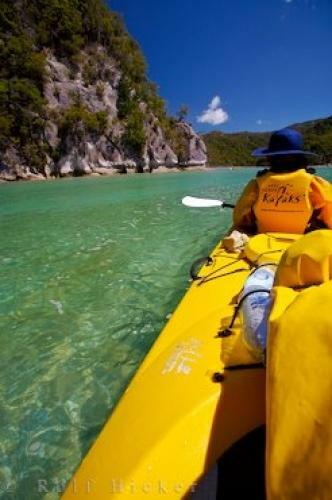 A great family vacation adventure during a visit to New Zealand is paddling the pristine waters of the Abel Tasman National Park during a sea kayaking Tour. The coastline of the Abel Tasman National Park on the South Island of New Zealand is the ideal location for a sea kayaking adventure! The cool clear waters that sweep across the white granite sands beneath are home to an array of marine animals such as New Zealand Fur Seals, and little blue penguins, while the skies and rocky outcrops are full of a variety of sea birds. Abel Tasman National Park of New Zealand. Captivated by the many sights and sounds of your sea kayaking adventure, you will hardly notice the time or distance slip by as you paddle into pristine lagoons and coves where fresh water rivers meet the sea, all fringed by lush native New Zealand forest. There's a variety of tours available by operators of sea kayaking adventures in the Abel Tasman National Park and most cater to anyone and their abilities - from beginner to seasoned paddlers. Incorporated into the kayaking adventure is also, in most cases, a hike for at least 20-30 minutes where the kayak guides double as a nature guide and show visitors the park from a different perspective. Be sure to check out our story about Kayaking in Abel Tasman NZ. Anchorage Bay Lagoon, Abel Tasman National Park, Tasman District, South Island, New Zealand. Model Released. I photographed this photo with the digital SLR camera model Canon EOS-1Ds Mark II, aperture of f/6.3, exposure time of 1/160 sec. on ISO 100, as always I used a original Canon Lens, the focus lenght for this picture was 16mm.